It’s been awhile since I posted a real update, but I’ll try to catch up on the last few weeks. I took about a week and a half off in early May and spent part of it in town and part of it at home in the Austin area. During the days that I was in town, I caught up on some projects around the house like cleaning and unpacking boxes of books and papers that I hadn’t unpacked in the, um, over a year I’ve been here. I also relaxed a bit and caught up on some reading as well. When I went home to the Austin area, I happened to fly from El Paso to Austin the same day that President Obama flew to El Paso to deliver a speech on immigration and then flew to Austin for a fundraiser. 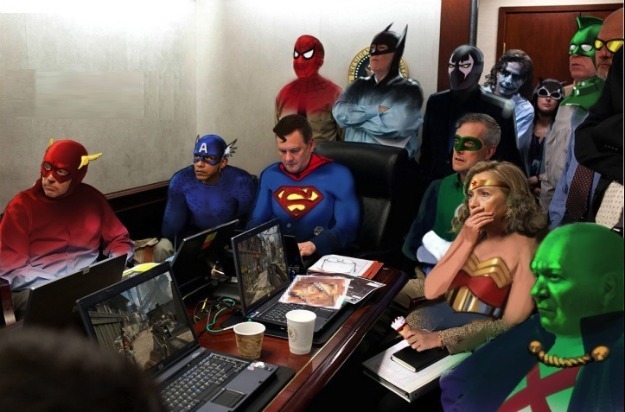 My flight was scheduled to leave El Paso and arrive in Austin a few minutes after Air Force One did, and I was worried about delays. I didn’t know if there would be extra security at the airport, so I headed to the airport early to give myself plenty of time, which was fortunate because, while it didn’t take me any longer to get in to the airport itself, I had to take two detours on my way there due to streets being closed for his motorcade. Somehow, the President managed to affect my travel more in El Paso than he ever did when I lived in the DC area for ten months. 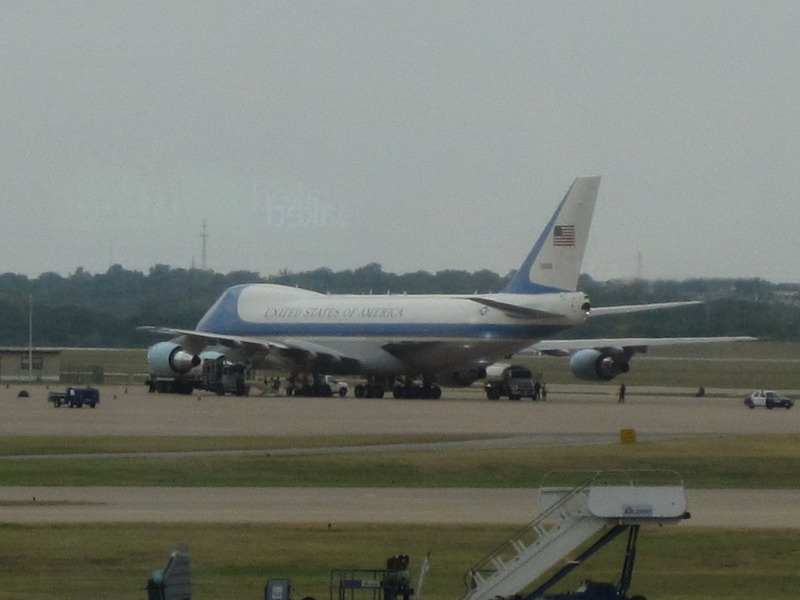 When I arrived at the airport in Austin, Air Force One was parked near one of the terminals and I was able to get a few neat pictures. Here’s one of them. It was really, really nice and relaxing to be home. I did some shopping, caught up on some sleep, and saw some friends. One of my friends from graduate school is starting A-100, the initial Foreign Service Officer training course, tomorrow and so I met with her and answered questions about A-100, packing, bidding, and so on. Hopefully, I didn’t steer her too far off course, hehe. It wasn’t a super-exciting trip, but it was relaxing and nice to just get away from work and do simple things like going to the grocery store after dark without being afraid. I think that it’s due to the stress of the work here and the violence, but I find that instead of wanting to travel to new places, I just want to go home or to familiar placces, where I don’t have to stress about where to stay, what to do, and so on. I’ve been back for a few days now and work has been busy, but good. I’m taking on a new portfolio at work where I’ll get to spend a few hours a week working on some different stuff, which is nice. The new work is interesting and it’s nice to have a break from visa interviewing now and then. There’s also some news on the bid-list front, but I think that that will be a separate post since I have a lot to say about bidding. Courtesy of The Cable at ForeignPolicy.com. After talking with a few fellow FS bloggers and a few bloggers outside the foreign service, I’ve decided to remove the password protection from the website later this week. There are a lot of awesome FS blogs out there that have been great resources and I’d like to contribute to that community. I’d also like to make the blog more easily accessible to friends and family. Before I started A-100, many of the FS blogs that I read helped me get an idea of what life as an FSO was like and gave me great ideas about how to handle packing and other logistical challenges. Now, I read them to learn about other posts and to keep up with friends all around the world. So, I’d like to pay it forward and make my blog public to prospective and current FSOs. I know that a few of you read this site via RSS feed and according to Posterous’ help page, the RSS feed link will change when I remove the password. Since I’m not sure if the old RSS feed link will work, I wanted to give y’all a chance to change the feed link in your reader. So, I’ll take the password off on Wednesday and post at least a short entry when I remove the password. So, if you read this by RSS feed and don’t see the short entry on Wednesday, you might need to come back and visit the site to get the new RSS feed link.